Weekends are special for all sorts of reasons, and not just the fact that you’re out of the office for a blissful 48 hours. The two greatest reasons must be the fact that you have the opportunity for a lie-in and also that you get to take as long as you want over your breakfast, without having to try and eat your toast whilst simultaneously putting on your coat and shoving your packed lunch in your bag. I live for late, long and leisurely breakfasts (enough that I already listed a few favourites in my breakfast post a while back – namely amazing all-rounder Poco), to the point where it could be arguably termed brunch. With that in mind, here are my top places in Bristol to indulge in my favourite weekend activity of ”brunching”. What happens when you take a Michelin-trained chef and get him to cook you brunch? Some of the tastiest, prettiest breakfast dishes in town, that’s what. Opt for the classic combo of smoked salmon with a perfectly poached egg, or go a bit more off-piste with sweetcorn fritters, halloumi & kasundi (a spiced tomato sauce), or potato rosti with wild mushrooms. Exceptional. Already frustratingly popular due to their fine food wares, lovely staff and lots of great reviews, you can choose to sit inside and gawp at the piles of gorgeous cakes and tarts, or watch the world go by from their suntrap decking out front. The coffee is some of the best I’ve had in Bristol, and the mashed avocado on toast with bacon is every bit as great as everyone says. The new king of brunch in Bristol, Bakers and Co. has its sights set on bringing the San Francisco brunch experience to the West Country, and is doing a damn fine job so far. The menu changes fairly frequently, but favourites such as granola, smashed avocado on sourdough, the full Bakers Breakfast and their famous custard toast (!) remain throughout the year. I had the potato cakes with duck egg, buttered leeks and romesco sauce when I went, and it was gorgeous. Their homemade cakes & biscuits are things of beauty too. Go, go, go. A large – you guessed it – bakery on Whiteladies Rd, these guys also serve up some delicious brunch dishes alongside their cakes, breads and pastries. I’m a big fan of skillets and they do a fine line in hearty selection of them – check out what specials are on offer when you pop in. Home to an award-winning brunch menu, this place is perfect for a harbourside munch, with one of the finest views in town. By night they offer a gorgeous tapas menu, but during the day you can choose from their generous house breakfasts (veggie or regular), Mediterranean-inspired dishes such as shakshouka or Balik Ekmek (marinated sardines), as well as the usual advocado or mushrooms on toast. If it’s too busy, their next door neighbour Broken Dock also boast a lush menu and the same brilliant views. Mushrooms on Toast with a Duck Egg and some Bacon @Spoke_Stringer for brunch. 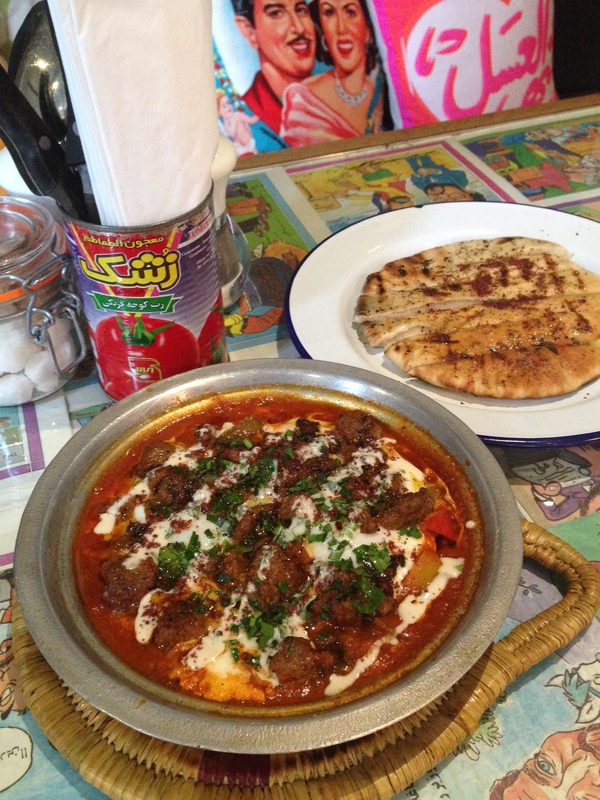 As well as offering some super tasty meals in the evening, Souk Kitchen also have one of the most exciting brunch menus in Bristol (scroll down to the second page on the link below); including breakfast tagine, souk eggs, French toast, grilled sardines and shashouka. Their second branch has just opened off Whiteladies Rd, so now Souk fans on both sides of the river can enjoy their flavoursome fare. Shashouka with crispy spiced lamb, from Souk Kitchen – now THAT’S what you call a brunch. Tiny and twee, but perfectly formed – this place serves as a launderette, internet hub and cafe all in one. Highlights of their brunch menu (served all day) include their great pancakes, but you can also get eggs on toast, muesli or sandwiches. There is a good selection of teas and usually 2 options for decent coffees, served in personal cafetieres. A calm oasis on the bustling Cheltenham Road. Pancakes at @The Well – get in ma face! You could be forgiven for thinking of US as a late night cocktail bar, what with all the metal, low lighting and industrial minimalism going on, however the food here is great and worth a visit at any time of the day. The Urban Standard breakfast comes up massive and includes black pudding and bubble & squeak, with other brunch options including buttermilk pancakes and Eggs Benedict. They also do scrummy Bloody Marys, or a special one with pineapple juice if you ask nicely! Another Bristol institution which recently opened a second branch, Rosemarino now serves up their Italian take on brunch to the masses in Clifton and Colston St. Their Rosemarino Breakfasts – whether veggie or regular, are packed full of quality ingredients, and I loved the addition of speck to their Eggs Bendict. But the real star is ‘Tommy’s 1 Pan Wonder’ – bacon, onions, mushrooms and potatoes fried in a pan, with eggs cracked over the top and melted cheese. Woof. Great food, piled high and fairly priced in this small cafe at the bottom of St Michael’s Hill. I’m particularly fond of their skillet dishes, but even their egg & bacon sarnie is tip top. A different vibe to the other venues here; this cafe on Welsh Back (or its dainty sister in Clifton Village) is very minimalist and chic. The weekend menu is simple yet high quality (served until 2pm) and you can also rely on great coffee, alongside a lush selection of cakes and pastries. Bristol is now packed full of high quality coffee shops, the highlights being the caffeine connoisseur’s haven Full Court Press and the slightly cosier Small St Espresso in the Old Town, although fine coffee (and one of the city’s best Full Englishes) can also be found at Source in St Nick’s Market. If you’re venturing out of the city centre, Milk Teeth in St Paul’s, Tincan Coffee on North St, Cafe Ronak on Gloucester Rd, Lockside in Hotwells and Tradewind Espresso on Whiteladies Rd are all pretty special. Hart’s Bakery next to Temple Meads also offers some great coffee alongside their array of fantastic treats, as does No. 12 Deli in Easton (along with arguably the best bacon sarnie in town). Of course, you’re never to far from a decent hot beverage or cake in this town, due to the success of local chain Boston Tea Party. Alternatively, if you’re looking for boozy or bottomless brunches in Bristol, this guide from Wriggle might come in handy!